Two pioneers in sustainable investing have just made a big move together in response to the rapid growth in the SRI field. 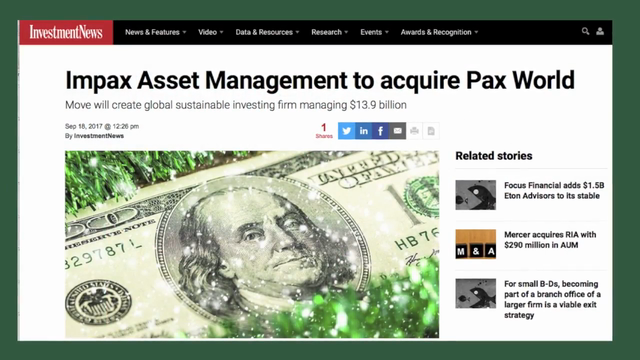 Pax World Management, a New Hampshire-based investment advisor to Pax World Funds, has agreed to be acquired by Impax Asset Management Group, a UK-based firm. The transaction will create a combined global investment management business with $13.4 billion in assets under management, and one with significantly expanded investment management, research and client service capabilities. The new group will offer enhanced resources and services to Pax’s and Impax’s existing and prospective shareholders and clients. Both firms have a heritage as pioneers in sustainable investing and share similar corporate cultures and values, having worked together as partners since 2007 on the Pax Global Environmental Markets Fund. This consolidation marks another big step forward for the SRI field.